Futures Trading for Excel is designed to quickly predict market price reversals in order to maximize futures trading profits. The Excel template saves valuable time but analyzing intraday pivot points to trade profitable futures price reversals. Traditional use of pivot point analysis used by traders has certain limitations. Futures Trading for Excel applies stochastic technical analysis in order to capture the strengths of pivot points while overcoming their limitations. Futures Trading for Excel is designed as a real time reversal screening and futures trade setup solution to scan for powerful reversal setups among one or more futures contracts in primary pivot zones that are most likely to generate profitable trades. Note: Futures Trading for Excel employs 5 minute price data and therefore a real time market data feed, DDE or ActiveX import tool is required to use the analysis. 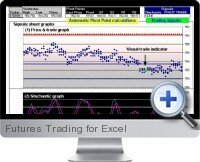 Integrates Excel, formulas, and data sources into a profitable futures trading solution. Position the template on your screen to show only the signal analysis while doing other work. Applicable to any futures contract including indexes, metals, stocks, currencies, financial data, and interest rates. Includes discipline and well-defined trading rules to pivot reversal trading. Pivot points and the associated support and resistance levels are treated as high probability "reversal ranges". Pivot failures are taken into account by reversing the entry rules under certain situations. Stochastic indicators are incorporated to screen for true reversals based on internal price strength. Trade frequency is minimized by screening for the best setups with greatest likelihood of profit. Technical analysis finds low risk trading strategies with stop placement nearby the entry point and large potential upside. Monitor multiple futures contracts by copying worksheets and adding contracts to the Signals sheet.